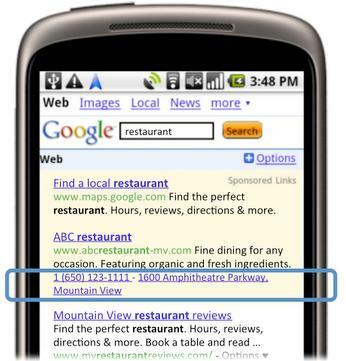 If you're a mobile advertiser, Google has just added a feature to their mobile ads you will want to check out. Click-to-call is now available for mobile ads, so that a browser can simply touch the screen of their mobile device (or navigate to it using a trackball) to immediately call the advertiser. This new feature should be especially attractive for local businesses. Instead of requiring a user to navigate to a website and search for a contact number, immediate access to the business is available for users on the move and who might be in the immediate area of the business. The ads are also geo-targeted, meaning a business closest to the user's current position will be highly visible. In all, the ability for immediate interaction is a key component to shortening the distance to a sale. Learn about getting your phone number clickable in mobile ads.